Pineapple farming is labour-intensive and plants take up to 18 months to produce fruit. Each pineapple is hand- picked and the crowns are broken off (not twisted) and collected for planting. “It’s not just about making money for the co-op members, we want to provide jobs for the people in the community and show by example that through hard work, we can make a thriving business right here where we’re living,” says Litha Zitshu, manager and member of the Bingqala Pineapple Co-op in the Peddie district of the Eastern Cape. 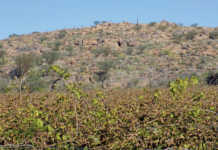 The collapse of the Ciskei Agricultural Corporation (ULIMOCOR) farms in the late 1990s left many Peddie residents unemployed, and the area saw an increase in crime and poverty. 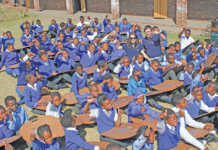 As a result, many Peddie residents, especially youngsters, were forced to leave their home villages for larger centres which offered more opportunities. It was against this backdrop that the idea of the Bingqala Pineapple Co-op was born. 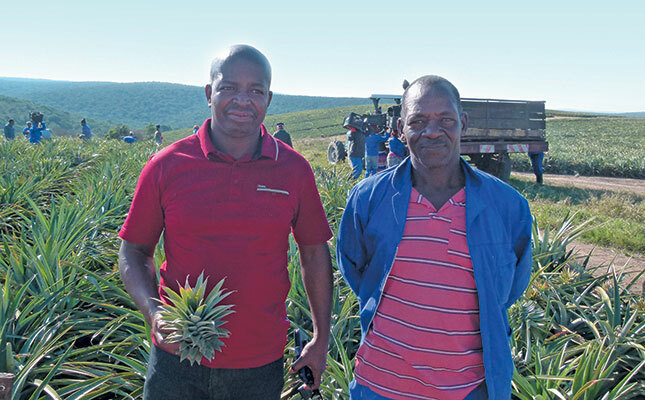 Bingqala Pineapple Co-op member and manager of the operation, Litha Zitshu (left), with fellow co-op member and foreman, Mbuyiseli Hempe. It was against this backdrop that the idea of the Bingqala Pineapple Co-op was born. This is also the reason Litha includes the employment opportunities created for Peddie residents by the project in his measure of its overall success. He is proud of the fact that the operation currently employs 28 permanent staff members and 10 temporary workers. This deeply rooted passion for the Peddie community has been a major influence in Litha’s dedication to the project and now, two years after planting, the operation is able to harvest its first Cayenne pineapples. Furthermore, the co-op has secured an offtake agreement for all fruit produced and Litha expects the co-op to earn in excess of R1,5 million this year. However, he emphasises that this success is the culmination of an eight-year collaborative effort and ultimately the result of much hard work. The idea of the project started in 2008, when 10 Bingqala village residents linked the growing poverty and other social ills in the area to unemployment and a general lack of opportunity in the Peddie district. Remembering how productive the surrounding ULIMOCOR farms had been, they decided to form the Bingqala Pineapple Co-op and attempted to revitalise one of these farms to once again turn it into a successful production unit. Group members approached their traditional leader, Chief Masilo Matomela, for permission to use part of the commonage for their project (the farms had reverted to commonage after their failure), and eight months later they also received official confirmation from the Department of Land affairs that the 540ha Clifford farm could be used for the project. In 2011, the co-op was registered and funding was raised to prepare the farm for planting. At this stage, the farm had no fencing or infrastructure. Funding of R400 000 was eventually secured from the Department of Rural Development and Agrarian Reform (DRDAR) in 2014, and in January of the same year, the co-op began fencing and ploughing lands and planting started in June. Initially, the co-op planted just 15ha to allow members the opportunity to learn the ins and outs of growing Cayenne pineapples. However, with technical and management support from Summerpride Foods and Bruce Venter from the Pineapple Growers’ Association, members soon decided to plant a further 27ha. Since then, the co-op has been learning new skills to overcome daily operational challenges. 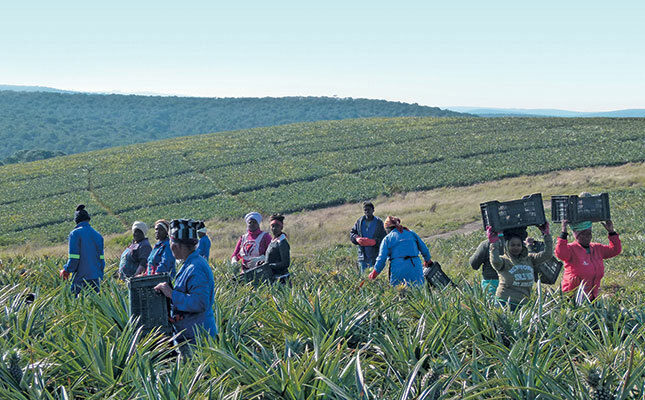 Peddie is situated just 70km away from Bathurst – where the first pineapples were introduced to the Eastern Cape in 1865 – and has a climate well-suited to pineapple cultivation. No irrigation is required, but to ensure that the first harvest would be of good quality, the lands were fertilised with urea, ammonia sulphate, potassium, zinc sulphate and potassium nitrate, supplied by DRDAR. A major challenge to daily operations, which Litha is eager to overcome, is that the project has little or no infrastructure, vehicles or equipment. Fortunately, he has managed to rely on a spirit of benevolence and co-operation among fellow emerging farmers in the area and has been able to borrow most of the equipment they have needed thus far. A further difficulty the co-op faces daily is protecting the pineapples from animals and theft. As a measure against rampant theft, especially late at night and early in the morning, three staff members are employed as security guards. Their duties include scaring away animals, which frequently invade the lands. The bush pigs especially enjoy eating the new fruit just as they appear on the pineapple plants, and usually leave a trail of destroyed plants in their wake, he says. Unfortunately, the measures which the co-op has implemented thus far have had little effect on curbing their activities. Litha is now considering bringing in a professional hunter to assist in their control. Despite these challenges, Litha and the other eight Bingqala Pineapple Co-op members have already achieved success, having harvested 300t from their first 15ha crop. Litha calculates that the fruit produced on the additional 27ha will result in total earnings of more than R1,5 million this year. Eager to build on this success and expand the operation, the co-op has already prepared a further 30ha to plant the crowns (tops of the pineapples) from this year’s harvest. To ensure that the new crop achieves similar success, the co-op will continue using fertiliser and also apply a forcing agent to ensure that the pineapples bear fruit at the right time. 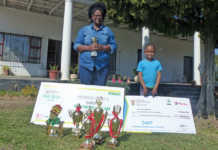 With the project proving the viability of revitalising the old ULIMOCOR pineapples farms and turning them into successful and sustainable businesses, Litha is enthusiastic about encouraging other villages to follow Bingqala’s example. “It takes a lot of your time and you can’t expect to be a phantom manager and check up only every now and then. But if you work hard, you can make it a success,” he says. Phone Litha Zitshu on 076 292 7001.